Details relating to the Estonian Commemorative of 2017. The coin commemorates 100th anniversary of the start of Estonia along the road to independence. With the February Revolution in Russia in 1917, Tsarist rule was abolished in Estonia. On April 12, 1917, the Provisional Government of Russia issued a decree on the autonomy of Estonia. The road to final independence was long and thorny. For details click this link. In the inner circle we see a sturdy oak tree with branches on one side of the trunk and leaves on the other side. The branches stand for the revolutions and accompanying hardships along Estonia's road to Independence. The leaves symbolize the rewards of the struggle and a prosperous future for Estonia. Around the edge of the inner circle, from eight to six o’clock is the inscription: “‘MAAPÄEV”. This was the name of the Provisional Assembly of Estonia. On a line running from eight to four o’clock is the date 1917 and Estonia’s name in the Estonian language EESTI. Directly under EESTI is the year of issue 2017. 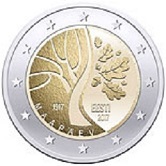 Return from Estonian Commemorative 2017 to euro coin collector.